LEAVE NO ONE BEHIND – Jaime V. Ongpin Foundation, Inc. Ambitious as it may seem, this statement is the core of the UN 2030 Agenda for Sustainable Development, which aims to tackle issues and meet the needs of all sectors defined in the 17 goals. Far more challenging is identifying those who are furthest behind and developing partnerships to address those needs. A new fund, the 2030 Agenda Transformation Fund commissioned by the German Federal Ministry for Economic Cooperation and Development (BMZ), supports the efforts of partner countries to implement the 2030 Agenda for Sustainable Development with innovative activities creating new impetus for the required transformation. They issued a global call for proposals for projects and activities to foster the implementation of the 2030 Agenda. Over 200 proponents from 63 countries submitted their application to the 2030 Agenda Transformation Fund. JVOFI’s proposal was one of the twelve (12) that were approved. 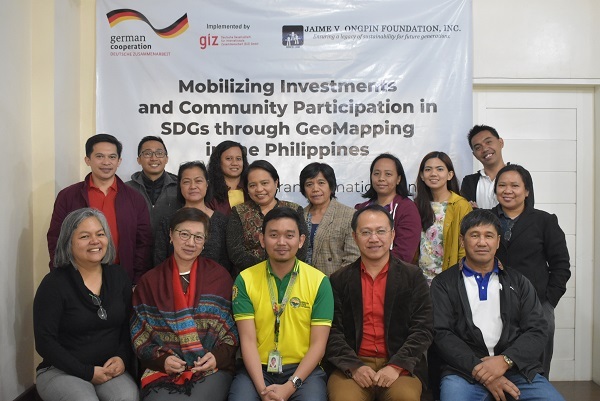 JVOFI has been implementing programs geared towards the marginalized communities, and now through this one-year project “Mobilizing Investments and Community Participation in SDGs through GeoMapping in the Philippines” (GIZ Project), JVOFI together with its project partners, shall contribute to achieving the Philippines’ commitment to the SDGs. The project aims to mobilize domestic resources and private investments for sustainable development through the development of partnerships between academic institutions, private sector networks and the government for the implementation of pilot development programs in specific communities. Poverty maps and visualization tools shall be employed to assist stakeholders in identifying priority SDG programs. JVOFI has partnered with the Benguet Provincial Government, PSA, NEDA, DSWD, DILG and the academe namely, Benguet State University and the University of the Philippines Baguio for this one-year project.